You may have heard something about Yiwu Zhejiang China, as it is the center of commodities, and paradise for businessmen, but you may not know the history of Yiwu market clearly. Roma can’t be built in one day; Yiwu market has a long history also. History of Yiwu market may start with a tradition. There is the tradition of trade in this inland city, whose farmland is so poor. In order to gain more grain, Yiwu people have to try everything they can to make their land richer. So they thought of trade. They use the local product brown sugar exchange for chicken feather, which can be used as fertilizer. Good looking chicken feather can be made as feather duster that would for trading again. Through do business around Yiwu people gain better life. The aspiration of having own market is unprecedented. At present, Yiwu market now has more than 400 million square meters of business area, operators position 62000, a collection of 16 sub-class of 9105 more than 170 categories of thousands of single products; concentration of the 1.8 million trademarks, 800 pieces of name trademarks, more than 6,000 distributor, the total distribution. Market is the boat for commodity, window for information, and bridge for trade. Yiwu market is becoming internationalization and modernization though the long history. 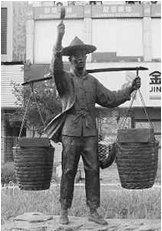 You can understand Yiwu well by learning history of Yiwu market. Also, you can be inspired by this long story.